ABIDJAN, Ivory Coast - United Nations Secretary-General Ban Ki-moon says forces loyal to the Ivory Coast president who refuses to cede power have attacked six U.N. vehicles, injuring two people. Laurent Gbagbo's loyalists burned one military vehicle belonging to the U.N. peacekeeping mission, Ban's spokesman Martin Nesirky said. Nesirky said the five other vehicles were attacked but not burned. In one attack, on an ambulance, a doctor and driver were injured. He said the U.N. is seeking additional details. Ban strongly condemned forces loyal to Gbagbo for attacking and burning U.N. vehicles and warned those responsible that destruction of property deployed to protect civilians is a crime under international law and they will be held responsible. Supporters of incumbent leader Laurent Gbagbo forced the vehicle they burned to stop at a makeshift roadblock in a pro-Gbagbo neighborhood. The driver was pulled out of the car and beaten while another group smashed the vehicle's windows and set it on fire, said a witness who declined to be identified for security reasons. The cocoa-producing country has been tense since a heavily disputed Nov. 28 election which the international community says opposition leader Alassane Ouattara won. Gbagbo, who refuses to give up power, still controls the military and security forces across this lagoon-side city. An Associated Press reporter who arrived on the scene in the Riviera II neighborhood after the attack saw the vehicle still smoldering. There were no U.N. troops or security forces in sight. The witness said the students also tried to stop a U.N. truck that drove by shortly afterward. The truck escaped, but the students grabbed a bag filled with what appeared to be U.N. peacekeeping uniforms, which some of them put on. After the U.N. certified Ouattara as the winner, Gbagbo accused the global body of bias and ordered thousands of peacekeepers to leave the country immediately. U.N. peacekeepers patrolling the streets of Abidjan have come under growing threat of violence, including one who was wounded in a machete attack last month. 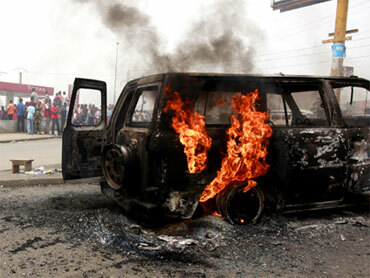 Violent clashes in Abidjan already have left up to 11 people dead in recent days, including four civilians. Authorities imposed a curfew in the Ouattara stronghold of Abobo and sent in a convoy of military trucks following fighting that began there Tuesday after a police raid. Up to seven police officers are among the dead, and army chief Philippe Mangou warned that his troops reserved the right to retaliate. "In order to find these people attacking the republic inside their hiding places, the armed forces of Ivory Coast want all human rights organizations, as well as the national and international community to know that that these attacks against us are equal to acts of war ... putting us in a position of legitimate self-defense," Mangou said in a declaration read on state TV on Wednesday. U.N. Secretary-General Ban Ki-moon has expressed deep concern about the violence in Abobo, and U.N. spokesman Martin Nesirky said that Ban urged both sides "to exercise maximum restraint and to avoid further clashes." Gbagbo lost the election by a nearly 9-point margin according to results certified by the United Nations. A peace agreement after the country's 2002-2003 civil war invited the U.N. to act as the final arbiter of the election, creating an independent mechanism for determining the outcome. Elections in Zimbabwe and Kenya in recent years have ended with the opposition candidate forced to accept a power-sharing agreement with the sitting president, even though most observers say the opposition had won in both instances. Country experts warn that Gbagbo is likely hoping for a similar arrangement and is using the tool of human rights abuses, including the military crackdown, as a way to raise the stakes. Africa expert Jennifer Cooke of the Center for Strategic and International Studies in Washington said there is a strong aversion from both African and Western leaders to reinforce the precedent of "government by negotiation." "The idea that an incumbent who loses an election need only hang on and threaten violence in order to obtain a power-sharing deal," she argues, "is a dangerous blow to democracy in a continent that will see some 15 national elections in the coming year."